Food is so seasonal here in Rome. Initially it was frustrating, planning meals with ingredients that could not be found. But you get used to it, and eventually I learned to cook with the seasons, and even look forward to each new wave of arrivals in the vegetable stalls. Asparagus comes for a month or so, then will be gone from the market until next April. Other times it might appear but might be imported, or expensive, and certainly not as good. So when asparagus is here, those interesting asparagus recipes from the last ten-eleven months need to be excavated and tested, while it is available and affordable. Today the market had glowing piles of red cherries, and the yellow melons are getting cheaper, which means soon the asparagus and strawberries will be gone. The watermelon stand at Circo Massimo has opened for the summer, so summer is just around the corner. And that means not turning the oven on, as it gets so hot here, so we had better enjoy these roast veg while we can! Heat the oven to 200C. Cover a baking tray with aluminum foil. Wrap each asparagus spear with a piece of prosciutto. It is easier if you roll them on slightly diagonally. Drizzle on the olive oil, and season with fresh cracked pepper. Bake at 200C for 10-12 minutes or so, until the asparagus is tender and the prosciutto is slightly crispy. Serve warm. 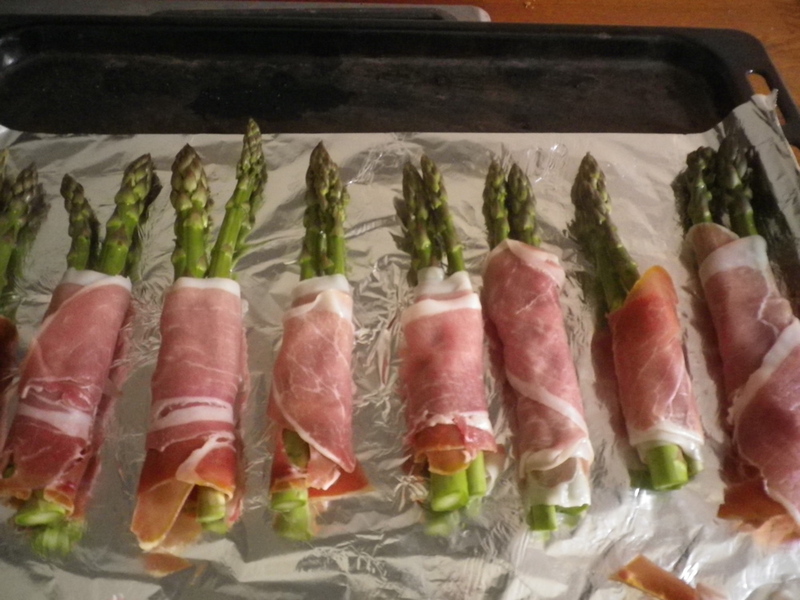 This entry was posted in food and tagged asparagus, prosciutto, seasonal on May 25, 2013 by krumkaker. Here in Rome, Thursdays means gnocchi. Growing up in Norway, soup and pancakes was a normal Thursday dinner. First soup (maybe fiskesuppe, or grønnsaksuppe, or ertesuppe), then thin pancakes with homemade jam, blueberry or strawberry or such. I get nostalgic for this, and I do bring back Bergensk fiskesuppe and Toro tomatsuppe med makaroni from Norway, along with other ethnic food, but normally I make soup from scratch. Case in point. We’d enjoyed asparagus spears with poached eggs and truffle salt the other day, and had the woodier bits left and some spears over. I chopped them up, chucked them in a pot, and hey presto, that was lunch for work and dinner for today. Sauté the onion in the olive oil for few minutes, until slightly soft. Add the asparagus, sauté two more minutes. 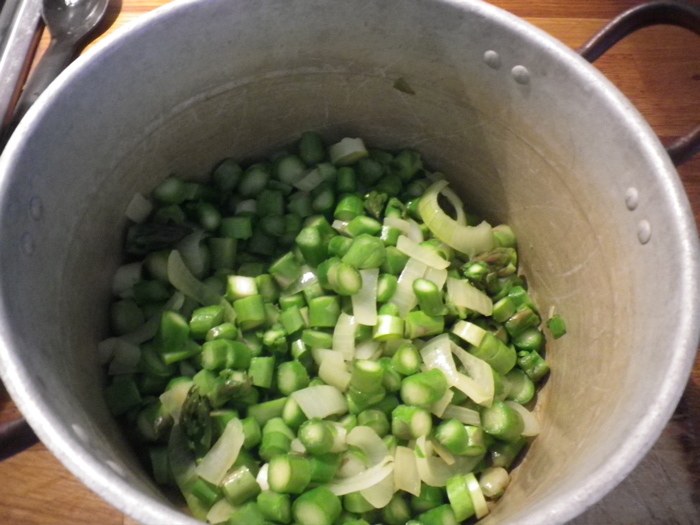 Add stock (or crumbled stock cube and water) and bring to the boil. Cook on medium hear 7 minutes or so, until the asparagus is soft (but not mushy). Blend with a immersion blender until the soup is smooth. Season with salt and black pepper, taste and serve. Beat eggs, add milk and flour and salt and mix until there are no lumps. Leave to swell for at least 30 minutes. Heat a frying pan with a little butter or oil, add a ladle or so of batter while turning the pan so batter is distributed evenly. These are not thick pancakes, they are more like robust crêpes, quite thin. Fry until golden, then flip and fry the other side. 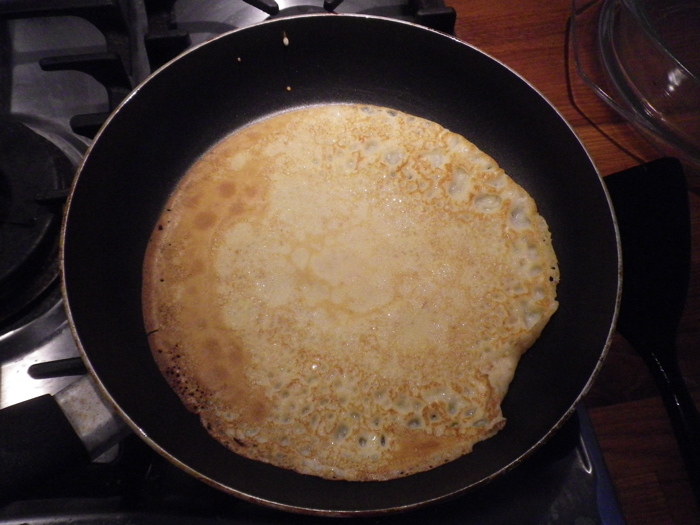 When done on both sides, put the pancake in an ovenproof dish with lid, so the pancakes can be kept warm. That way everyone can eat together. I had my pancakes with homemade cloudberry jam (multesyltetøy) from my aunt. Cloudberries look like little yellow raspberries but grow wild on on marshes, they are quite tart and a delicacy. The Rome IKEA sometimes has cloudberry jam; just look for hjortronsylt, that’s the Swedish name. Serve the pancakes with whatever you like: lemon juice and sugar, maple syrup, blueberry jam. What’s your favourite? 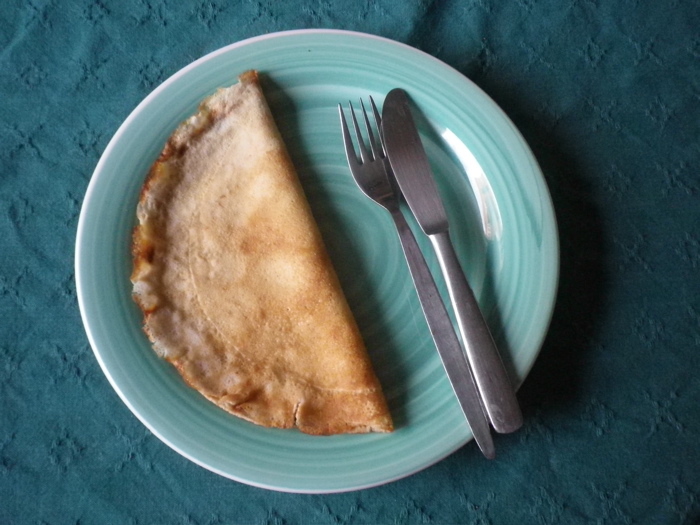 This entry was posted in food and tagged asparagus, Norwegian, pancakes, soup on May 8, 2013 by krumkaker. Spring, the first heatwave of the year and lovely crisp affordable asparagus at the vegetable shop downstairs. What to do with it? Toss it with ginger fried rice, or serve it roasted with Sriracha mayo? Or maybe on a pizza with mushrooms, prosciutto and balsamic glaze? So many choices…. Those are on the very-expanding to-try list. “Uova in camicia” means egg in a shirt, it’s Italian for a poached egg. I have no idea why. I’d seen this on scattodigusto: 5 cose da fare con gli asparagi. L’uovo in camicia, per esempio and did my best to replicate that. We poached two eggs, boiled a handful of asparagus tips (a bit too long, I confess), then drizzled on some olive oil, smoked paprika and truffle salt. With some toast on the side, delicious! This entry was posted in food and tagged asparagus on May 2, 2013 by krumkaker.